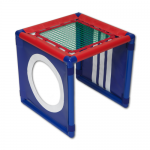 The Drill Cube is a multi-functional skill station featuring stumps, target circle, rebound net and tunnel space. It can be used to explore all the key core skills of cricket. View the videos below to see it in use. We flipped the Drill Cube on its side and used the rebound net as a warm up activity to get the hand-eye coordination going. This also is good preparation for pick ups in the outfield.